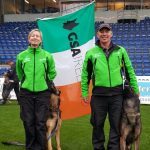 GSA Ireland congratulates Jim Caldwell and Neo vom Bachfeld of OG Templepatrick for their participation at the WUSV World Championships in Randers, Denmark. Congratulations to competition winners Czech 02 Vaclav Ouska and Qvido Vepeden with 98-94-93 = 285 points and team place winners Czech Republic. Whilst Jim and Neo sadly did not qualify in tracking, with 50 points (M), they scored 70 points in obedience (B) and 87 points in protection (G) . Thanks to the judges/tracklaying team/helpers, the organising team and volunteers in Denmark and to those from Ireland, Denmark, Finland, the Netherlands, USA and Great Britain who assisted the Irish team this year in their preparation and training and those who cheered on Jim and Neo in the stadium and from home at their first ever world championships. Thanks again to Karanberg for the sponsorship of the team tracksuits and to the Frazer family for their donation of jerseys. Team Captain was Clare Weir. Jim would like to thank Abbey Villa FC and Aqua Dog for their assistance in the run-up to the competition and to Raymond Breslin of OG Templepatrick who travelled to assist the team in Denmark. 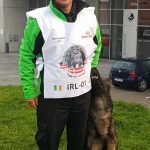 We now look forward to the WUSV IGP Championships in Modena, Italy in 2019!